Rooney Mara, Joaquin Phoenix, Chiwetel Ejifor star in Garth Davis’ (Lion) drama. Iranian director Jafar Panahi’s fourth completed feature since he was officially banned from filmmaking. An absurdist Iranian comedy. Patron Members Free - ​unless otherwise noted. the debut Zine by writer, historian, activist Jeffery U. Darensbourg, which chronicles the 1600 year indigenous history of the New Orleans area is proudly on sale. $8. "Something for and against everybody"
was founded in New Orleans in November 1986. November 2018 was Zeitgeist's 32nd Anniversary! ​And we've never looked better! We have finally received our Alcohol permit, so the Lounge is now stocked with a full selection of beer, wine, mixed drinks and cocktails. ​We have received a "Performing Arts Exception" which means we can operate as an ALL-AGES venue and still serve alcohol. Children and minors may attend Zeitgeist films, concerts and events, but can not sit at or approach the bar. They may not also consume alcohol. To purchase and consume alcohol you must have a valid ID. 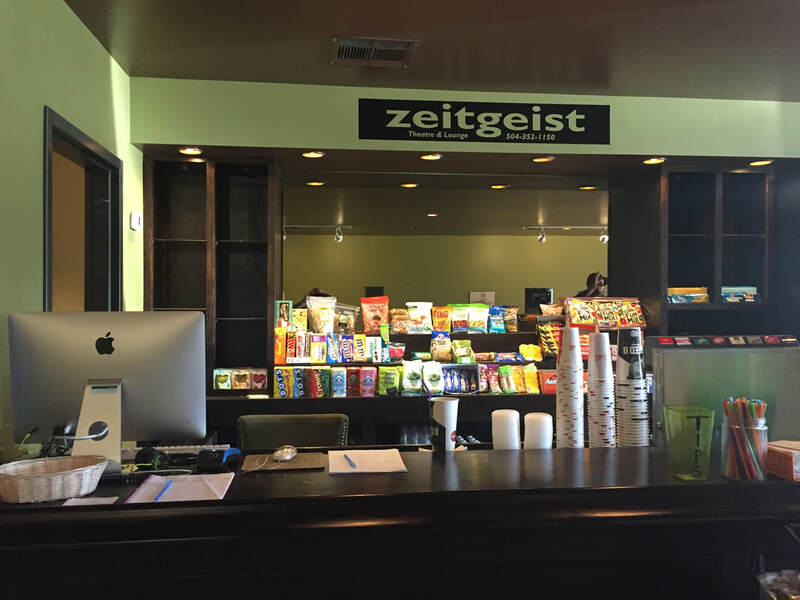 Zeitgeist is a SMOKE-FREE environment. HOOP DREAMS goes to the mat in this intimate, coming-of-age documentary about four members of a high-school wrestling team at Huntsville’s J.O. Johnson High School, a longstanding entry on Alabama’s list of failing schools. Coached by teacher Chris Scribner, teammates Jailen, Jamario, Teague, and Jaquan each face challenges far beyond a shot at the State Championship: splintered family lives, drug use, teenage pregnancy, mental health struggles, and run-ins with the law threaten to derail their success on the mat and lock any doors that could otherwise open. Tough-love coach Scribner isn’t off the hook, either; he must come to terms with his own past conflicts while unwittingly wading into the complexities of race, class and privilege in the South. Director Suzannah Herbert and Co-Director Lauren Belfer captured over 650 hours of footage during the course of the team’s final season to create this closely observed, deeply affecting depiction of growing up disadvantaged in America today. Screens as part of our weekly International Children's Film series MOVIE DAYS. Winner of 6 Audience Awards for Best Documentary on the film Festival circuit. She is one of the most transformative yet misunderstood women in history, alternately vilified as a sinner and canonized as a saint. For the first time, the incredible story of Mary Magdalene is told through her own eyes. In the first century A.D., the free-spirited Mary (Rooney Mara) flees the marriage her family has arranged for her, finding refuge and a sense of purpose in a radical new movement led by the charismatic, rabble-rousing preacher Jesus (Joaquin Phoenix). The sole woman among his band of disciples, Mary defies the prejudices of a patriarchal society as she undergoes a profound spiritual awakening and finds herself at the center of an earth-shaking historical moment. Boldly challenging received wisdom, Mary Magdalene is a rapturous, moving account of a miraculous woman who risked everything to follow her faith. From the acclaimed director of Lion, the film also stars Chiwetel Ejiofor. Iranian director Jafar Panahi’s fourth completed feature since he was officially banned from filmmaking is one of his very best. Panahi begins with a smartphone video shot by a young woman (Marziyeh Rezaei) who announces to the camera that her parents have forbidden her from realizing her dream of acting and then, by all appearances, takes her own life. The recipient of the video, Behnaz Jafari, as herself, asks Panahi, as himself, to drive her to the woman’s tiny home village near the Turkish border to investigate. From there, 3 Faces builds in narrative, thematic, and visual intricacy to put forth a grand expression of community and solidarity under the eye of oppression. Oh and by the way, it gradually evolves from a taut mystery into an outrageously absurd and delightful comedy. Blue is the color of vastness: of ocean, of night sky; of a starry constellation or a moon-dappled sea surface. It is the color understanding can’t reach. And yet, balanced carefully within the immense and the enigmatic, there is the intimate and the knowable. There is the egg, to me a symbol of protection, encompassing the fragile yolk. I believe we live within this yolk, enrobed in yellow, suspended in space, protected from the blue by a filmy margin and a shell-thin edge. Eggs—specifically yolks—are a recurring motif in my paintings. Yellow orbs represent comfort and calm, a safe haven in which we are swaddled and protected. In the Night Egg series, designs and reveries are woven within this yolk, free from anxiety and from thoughts of darkness or vastness. The yolk is a sacred space for the personal within the universal: the micro within the macro. Alkonost is the name for the half-bird, half-woman creatures that appear in Russia's vibrant and ancient folklore tradition. The alkonosts allow me to explore both composite creatures (birds and humans) and composite cultures (Russian and Louisianan) and to create a new mythology, a new kind of deity, one that protects various elements of the Louisiana landscape. With the Louisiana Mythology series, I strive to create a visual language specific in which each element can be read and parsed out almost like a book. Louisiana is already rich in its cultural icons, natural landscapes, and fables, and in much of my work I play with these extant cultural components, layering them atop other traditions and visual languages to create a new mythology specific to the state. Protection and guardianship-- specifically female guardianship-- appear frequently in my paintings. Much like a talisman you wear around your neck, I like the idea that a painting can be a protective object for your wall, can act as guardian of your space. The alkonosts have dominion over their static ecosystem in the particular world of the painting-- whether the oak tree or magnolia, the caladiums or irises, the fish or crawfish-- but as an object on your wall, they also serve as guardians over your room, your space, whatever dynamic ecosystem they come to occupy. David C. Symons is an accordionist, composer, singer, and accordion technician living in New Orleans since 2012. He founded and currently leads New Orleans-based Brechtian european chamber folk cabaret ensemble The Salt Wives, klezmer band Klezervation Hall, Vermont-based band Inner Fire District, founded legendary Vermont bands Black Sea Quartet and The Brass Balagan, and has played in many bands, including Daniel Kahn and The Painted Bird, Ezekiel’s Wheels, Debauche, and The Underscore Orkestra. He is a former musical director of Spielpalast Cabaret in Burlington, and has worked as a composer for The Vermont Stage Company, as well as acting in many plays. He originated the role of Hades in the original 2006 and 2007 productions of Anais Mitchell’s folk opera Hadestown. David is a former faculty member of The Summit School in Montpelier, VT, where he taught a course on klezmer music. He is one of the founders of the New Orleans Accordion Festival and BrechtFest. Kirk Duplantis is an eclectic drummer/composer who's work spans across all genres, performing with Tasche and the Psychdelic Roses, Mighty Brother, Biglemoi as well as his own jazz fusion quintet. The concert series will feature a changing lineup of amazing musicians from the New Orleans creative music scene and will be announced weekly. This weeks guest DAVE EASLEY (pedal steel midi). $10. Moroccan musician AMINE BOUCETTA, MICHELLE WELCHONS & SIMON MOUSHABECK perform a weekly program of Classical Arabic and Turkish music . Oud, Ney Flute, Arabic Accordion, Riq, Tabla, Darbuka, piano, etc. Join them to discover different styles of music from across the globe each week. $10. 24th - Ian Cook, Sarah Jax, Justin Peak, etc. With the impending August release of Scary Stories to Tell in the Dark from director André Øvredal and producer Guillermo del Toro it’s safe to say that a whole new generation is about to be introduced to the haunting works of author Alvin Schwartz and illustrator Stephen Gammell. Their trilogy of collections of folk stories and spooky tales were ostensibly intended for children, but as those who grew up in the 1980s and 1990s know, they quickly took on a life of their own. Topping lists of titles banned at school libraries for the entire decade of the 1990s, Scary Stories gained an undeniable aura of mystique. Those who grew up with the illustrations of Gammell in particular are unlikely to ever forget them. The documentary, directed by Cody Meirick, reportedly features more than 40 interviews, including “folklorists, artists and fans” such as fellow children’s horror author R.L. Stine. Screens as part of our weekly International Children's Film Series MOVIE DAYS. Recommended for teens and adults. This Canadian indie black comedy based on an absurd but true story stars Ethan Hawke, Mark Strong, Noomi Repace, etc. Thursday, August 23, 1973, an ordinary late summer day in Stockholm. At 10.03 a masked robber stepped into Kreditbanken at Norrmalmstorg in Stockholm. It was the beginning of one of the most internationally recognized crime cases in Sweden's history. In the hand, the robber Janne Olsson, held a submachine gun. He shouted in English to the staff to lie down on the floor. At the same time he fired his gun. In the commotion, however, a bank official managed to reach the alarm. The hostage situation depicted in the film is what originated the psychological phenomenon known as the "Stockholm syndrome", where hostages develop a psychological alliance with their captors as a survival strategy during captivity. It screens as part of our ongoing series CANADA IS BIGGER THAN THE U.S.
Two miles into the earth, nine Appalachian miners struggle to survive after a methane explosion leaves them with one hour of oxygen. Mining country in Appalachia has been declared The Devils Playground. A close-knit group of veteran miners, all friends and family, commence what would be a normal days work -- except today a rookie, the son of one of our veterans, joins them the god-son of the section leader, 18 year old Ryan. With ever growing safety concerns at the mine, Zeke (Section Leader and longtime coal mining veteran), struggles with the correct course of action, weighing on one hand the safety of his men, and on the other, the need to earn a steady wage in an economically depressed region. Today, however, fate takes matters into its own hands when a huge methane explosion rips through the mine. Smoke engulfs the men, forcing them to rely on nothing more than, brains, brawn, and faulty self-rescuers (oxygen tanks that afford them one hour of air). Mine 9 is the story of the struggle for survival against all odds; men trapped in hell as the result of exploitation, greed, and circumstance. JAMES SINGLETON (Bass) and JONATHAN FREILICH (guitar). A beautiful and contemporary retelling of Colin Thiele's classic Australian tale. 'Storm Boy' has grown up to be Michael Kingley, a successful retired businessman and grandfather. When Kingley starts to see images from his past that he can't explain, he is forced to remember his long-forgotten childhood, growing up on an isolated coastline with his father. He recounts to his grand-daughter the story of how, as a boy, he rescued and raised an extraordinary orphaned pelican, Mr Percival. Their remarkable adventures and very special bond has a profound effect on all their lives. Based on the beloved book, Storm Boy is a timeless story of an unusual and unconditional friendship. Screens as part of our weekly International Children's Film Series MOVIE DAYS. Three young women were sentenced to death in the infamous Manson murder case, but when the death penalty was lifted, their sentence became life imprisonment. One young graduate student was sent in to teach them - and through her we witness their transformations as they face the reality of their horrific crimes. From the acclaimed director of I Shot Andy Warhol, American Psycho, The Notorious Bettie Page. Starring Matt Smith, Hannah Murray, Suki Waterhouse, Annabeth Gish, Grace Van Dien, Chase Crawford, etc. Terry Gilliam's epic tale, decades in the making, finally sees the light of day! Jonathan Pryce and Adam Driver star in the film that audience have been waiting on for years. Toby, a cynical but supposedly genius film director finds himself trapped in the outrageous delusions of an old Spanish shoe-maker who believes himself to be Don Quixote. In the course of their comic and increasingly surreal adventures, Toby is forced to confront the tragic repercussions of a film he made in his idealistic youth - a film that changed the hopes and dreams of a small Spanish village forever. Can Toby make amends and regain his humanity? Can Don Quixote survive his madness and imminent death? Or will love conquer all? Master filmmaker Zhang Yimou (Raise The Red Lantern, Red Sorghum, Yellow Earth) returns to the genre he mastered with HERO and HOUSE OF FLYING DAGGERS with this stunning, gorgeous story of a commander who uses a lookalike to trick a kingdom into all-out war. Set during China’s Three Kingdoms era, Shadow is the story of a Commander (Deng Chao) in the kingdom of Pei, living in exile as a disease ravages his body and ages him prematurely. Fortunately, the Commander has a “shadow” named Jing (also Deng Chao), raised from childhood as a body double, though he is not nearly so proficient a fighter. Now, with the help of the Commander’s wife (Sun Li), Jing must train to take the Commander's place duelling an opposing general so that the Commander may retake the walled city, acting against the peaceful politicking of their king (Ryan Zheng). All of this, while Jing pursues his own ulterior motives. Internationally-renowned artist Fiore De Henriquez flew in the face of 20th Century gender norms, blazing her own trail and shaping her own identity in the art world across Europe and the United States. But there was more to Fiore than sculpture. While battling with - and eventually accepting - her intersexuality, duality became prominent in her art, her life and her explosive love affairs. Screens as part of our ongoing series BEUYS AND BEYOND: CONTEMPORARY ARTISTS ON FILM. Meeting Gorbachev is a 2018 biographical documentary film directed by Werner Herzog and André Singer about the life of Mikhail Gorbachev, the eighth and last leader of the Soviet Union. presented by visiting filmmaker Calaine Schafer. A subversive romantic comedy about a real-life vampire and the IRS agent who audits her. There will be an after party with Capes, Cocktails and filming of the film tour podcast. In 1989, Zeitgeist curated a city-wide film series BEUYS AND BEYOND: CONTEMPORARY GERMAN ARTISTS ON FILM which also featured artist talks and performances by area artists. A weekly International Children's Film Series. Since 1993, Zeitgeist's ongoing SERIES OF FILMS, MUSIC, PERFORMANCES AND VISUAL ART celebrating the innovative, utterly bizarre and extremely vast body of work from our neighbors to the north. Their films may be smaller, but at least their country is bigger! Size does matter. Schedule is subject to change as films are held over – please check the website for updates nightly. Zeitgeist is a non-profit, artist run media arts center that celebrates its 32nd anniversary this November. People keep asking or speculating why we are moving to Arabi. Here is the reason. Zeitgeist Multi-disciplinary Arts Center has been on Oretha Castle Haley Blvd for the past 19 years and we were not really looking to move. We have been very happy there. We love the space, our landlord and our neighbors. And yes Mike Tata (Friday Night Boxing Gym) you are our best customer. People kept telling me I should look at the theatre space on St. Claude and Desire that had been scheduled to be Indywood. It was a great space, but no parking. Still I was interested until I saw the Valiant Theatre and Lounge. I go to Gerald’s Donuts in Arabi often after Zeitgeist closes to eat with my friend Ellis Fortinberry who runs Chalmette Movies. He mentioned that he had seen a for lease sign on a theatre a couple of blocks away on St. Claude so I called the number. Looking at it I knew right away Zeitgeist could never afford a venue this incredible, but the property manager told me that when she told the owners that Zeitgeist was interested in seeing the space, luckily our reputation proceeded us. The owners are the Meraux Charitable Foundation, whose main concern was luckily for me not just about money, but what tenant would best advance their development and promotion of the Old Arabi Cultural Arts District. When I saw a drawing for St. Bernard Parish and the Meraux Foundations plans for the district I knew Zeitgeist had to move. Making the decision to move outside of Orleans Parish (by one block) was a hard one. I still don’t know if my audience will follow me or be willing to travel across town much less the industrial canal. Luckily the response has been overwhelmingly positive and people seem extremely excited about the new location and the off street parking. 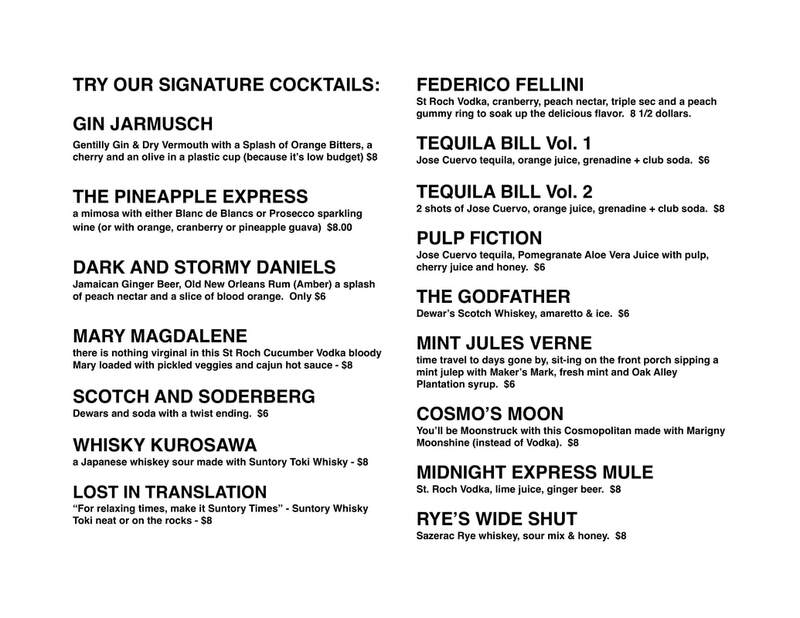 I think this will be the best thing to ever happen to Zeitgeist. The new venue gives us a chance to expand our programming and the Lounge gives us a great opportunity to increase our audiences and our revenues. We hope you will continue to support us and our world class, incendiary cinema as we venture forth into this great new adventure. 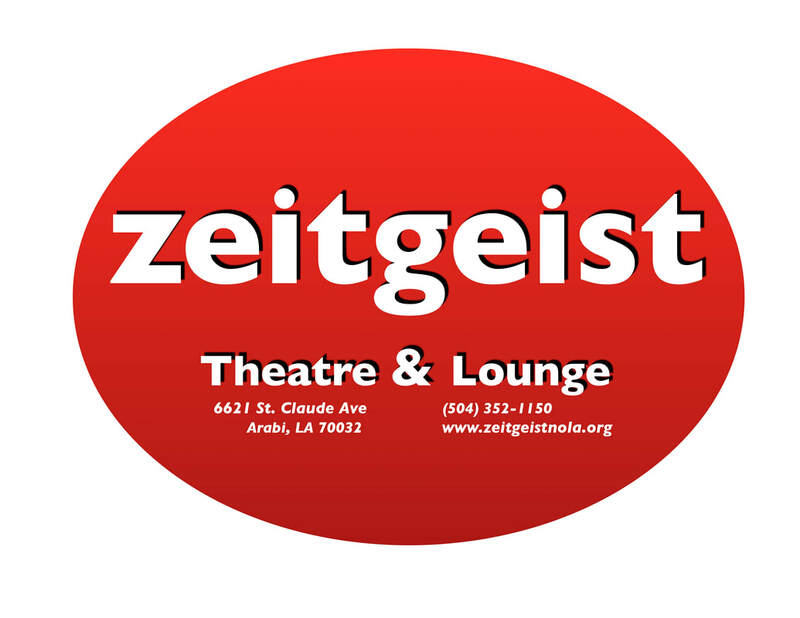 "Zeitgeist will be located on a two-block “arts campus” assembled by the Meraux Foundation as a public interest project to accelerate the growth of the Old Arabi Cultural District and improve the economy and quality of life of St. Bernard Parish. The stretch also includes Studio Inferno and St. Claude Arts, a collection of studios and galleries."